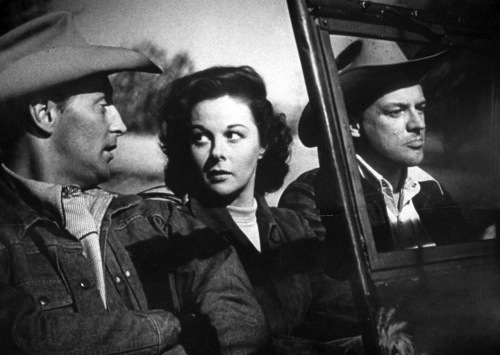 This is a film that seems tailor-made for Robert Mitchum; it has drama, GREAT dialogue, a love triangle, and plenty of action/thrills (involving the rodeo)! I just learned that it was directed by the prolific Nicholas Ray (In a Lonely Place, Rebel Without a Cause, King of Kings, etc.) After he sustains a rodeo injury, star rider Jeff McCloud (Mitchum), returns to his hometown after many years of absence. He signs on as a ranch hand, where he is befriended by fellow ranch hand Wes Merritt (Arthur Kennedy, a strong supporting man, esp. 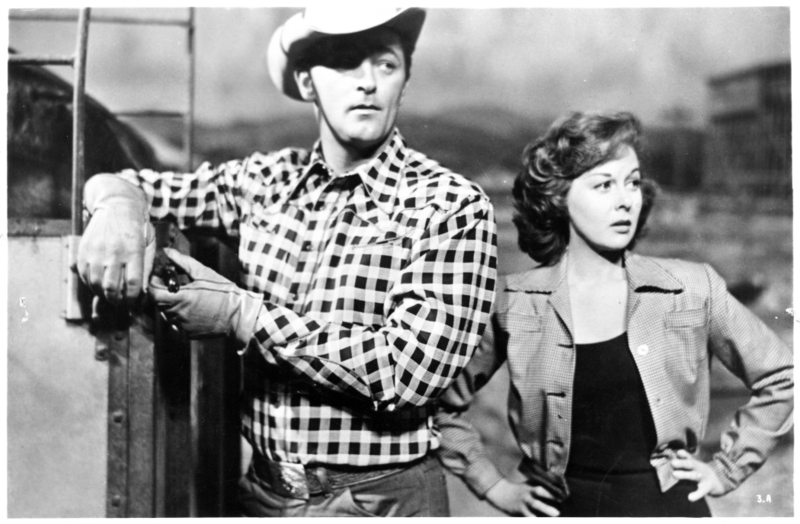 of the Western genre) and his wife Louise (Susan Hayward in a strong/engaging performance). Louise: Wes tells me you once made three thousand dollars in one day, rodeoin’. Louise: And threw it all away. Jeff: Oh, I didn’t throw it away. It just sorta’… floated. The Merritts seem like a solid, happy couple, though they also have ambitions for their own little farm. Wes thinks that rodeo winnings (fast money) could help finance it. Wes convinces Jeff (who is a BIT reluctant) to coach him, but Louise has strong doubts. She thinks that the couple should just keep saving slowly. But, despite his easygoing/humble demeanor, Wes has a lust for adventure! It turns out that Wes is QUITE good in the events he signs up for in his first rodeo, impressing his new peers on the circuit. Of course, the money is GREAT, so he decides to go on the road (BEFORE checking w/ Louise). She is surprised by this hasty decision, BUT goes on the road w/ her husband and Jeff. How will Wes and Louise deal w/ their new success/lifestyle? What will become of Jeff… and his burgeoning feelings for Louise? Watch this film to find out! Hmmm… never noticed anything wrong w/ it! But remember how Harrison Ford broke his nose, BUT never fixed it?